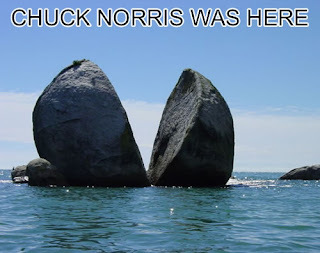 It's time for Chuck Norris again! You may not be aware of it, but he is the greatest - ever! There's even a web site just for facts about him! I posted some of my favorite facts a long way back, here are some more. They will definitely pick you up on a Monday morning! Chuck Norris doesn't actually write books, the words assemble themselves out of fear. - I could use this skill! Chuck Norris can divide by zero. - I knew all along that something was not right with all those math classes I took in college! When taking the SAT, write "Chuck Norris" for every answer. You will score over 8000. - I'll do this when I take my exam in November. Maybe I'll be number one, lol. Chuck Norris can set ants on fire with a magnifying glass. At night. - Moonlight??? If at first you don't succeed, you're not Chuck Norris. - ha ha ha, I am NOT Chuck Norris! MacGyver can build an airplane out of gum and paper clips, but Chuck Norris can roundhouse-kick his head through a wall and take it. - I love MacGyver, but you just can't deny this!